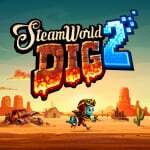 SteamWorld Dig 2 is likely near the top of a number of Switch eShop wishlists, as it's the long-awaited direct sequel to Image & Form's breakout hit (as it was back then) on the 3DS eShop. Given the lead role it had in the Nindies Showcase in Switch launch week, it's evidently a big part of Nintendo's pitch for the new console's online store. The latest episode of Image & Form's 'Engine Room' video series is well worth a watch for those looking forward to the game, as the title's lead designer joins community manager Julius to answer a whole load of questions. They tackle enquiries on the likes of HD Rumble, the prospects for a physical release and more. Are you looking forward to digging into this one later in the year? Release date? My money is ready. HD Rumble? What every gamer has been waiting for all their gaming life. That's not anything against the company, they're brilliant. I own SteamWorld Dig and Heist both physically and digitally on Wii U. It's a general slight against HD Rumble. I think it's a gimmick that won't ultimately amount to much. I'm sure Nintendo could help them out again with a physical release. Only this time I hope Nintendo put their manky Nintendo Selects branding on the cover. @SLIGEACH_EIRE Have you actually experienced HD rumble? It's actually the next level of immersion. Love these guys. I can't think of any other devs that have their faces out there nearly as much as these guys. You can ask them anything and you will get a response. When will Nintendo hand them the rights to do a 2d Metroid?! @Aurumonado In all fairness, as the self proclaimed anti @SLIGEACH_EIRE , I hear HD Rumble is a joke. Haven't tested it myself because the only game worth owning on my switch doesn't have it (zelda). Great episode, as usual, but I did miss Brjann's natural charisma. @SLIGEACH_EIRE Says the guy that disses the Switch pretty much every chance they get. Why are you here? Isn't Julius the most charming and handsome game developer ever? @Amsterdamsters Yeah,he's in every article it seems like.There's an ignore feature now? PS4 controller has the HD rumble for years now. Only the free Playroom software uses this feature: when you shake the Dualshock 4 controller, you can hear and feel the tiny robots inside. No other PS4 games use this feature so most people aren't even aware of it. It really is a gimmick. I am extremely excited for this game. I triple-dipped the first one (3DS, PS Vita, PS4) because I love it that much. I dare say I'm more pumped for Dig 2 than Odyssey. Well, at least equally anyway.